Al-Shabaab expects to achieve certain aims by operationalizing their jihad across East Africa as explained earlier. Nonetheless, the limited aims of the upcoming Ramadhan offensive can be summarized as follows. To begin with, al-Shabaab anticipates that its hostile activities in Kenya would induce the Kenyan government to effect brutal, vicious and ineffective counter-terrorism measures against the resident population of the areas affected thus provoking the Muslim populations in the affected areas to rise up against the government. 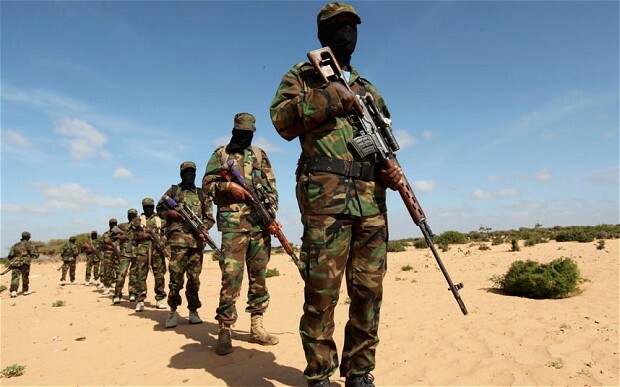 Secondly, al-Shabaab intends to escalate its terror campaign in Kenya by capturing and holding territories thereby achieving a limited measure of strategic depth that would enable them to efficiently resist a counterattack. Finally, al-Shabaab aims to undermine the psychological operations being conducted against them by demonstrating to the global audience that the intelligence reports which touted their gradual weakening and declining military capacity are wrong. More so, Al-Shabaab aims to create a crisis of confidence in the counter-terrorism policies and practices of East African governments (along with those of the allied Western governments); as well as deal a psychological blow to the troop contributing nations by inflicting an unprecedented casualty count on their troops and citizens. 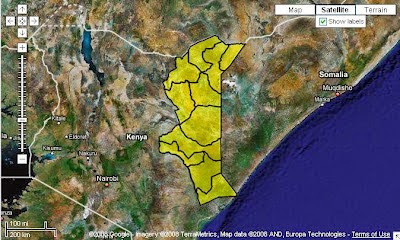 Map Showing the Somali-dominated Regions of Kenya. Photo Credit:Google Maps. 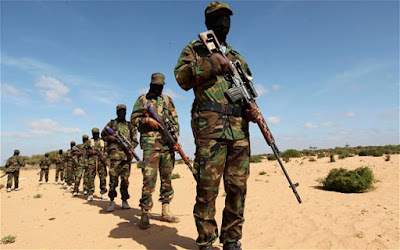 On Sunday, 14th June 2015, over five dozen al-Shabaab terrorists invaded several areas in Lamu County and were able to terrorize the residents for over three hours. Thereafter, they conducted an ill-fated attack on a military outpost within the same county. This attack reveals three facts; al-Shabaab has already deployed operatives in Kenya; the jihadists have limited local support; and that Kenyan intelligence is prone to failure to detect al-Shabaab attack plans. Reliable intelligence reports estimate that there are approximately 2,000 armed jihadists already entrenched in Kenya for the upcoming terrorist campaign. By October 2014, Al-Shabaab had been crippled by its losses but its senior leadership has been able to roll out an aggressive recruitment drive that has seen the jihadist group create a formidable pan-ethnic fighting force. Militarily, al-Shabaab has been unable to hold any significant territory in Kenya but its terror attacks within the nation has succeeded in creating a political crisis within the nation as well as psychologically drain the confidence that civilians had in the Kenyan intelligence services. According to Dr.Sumara (one of al-Qaeda’s top military strategists), amniyaat has assessed that Kenyans generally perceive al-Shabaab as relatively strong, brutal and strong-willed; while concurrently viewing the Kenyan government as uninspiring, brute and ineffective towards the terror threats facing the beleaguered East African nation. Al-Shabaab’s general offensive is designed to coincide with the Muslim month of Ramadhan when its Islamist allies across the Arab world would also launch general offensives of their own. The jihadist strategists have planned for the offensive to come in the heels of the defensive war that Al-Shabaab has been fighting in Somalia where its forces have lost control of almost all major urban areas – an observation which has convinced many Western intelligence analysts to conceive al-Shabaab as a defeated nemesis striving for survival in a hostile environment. Africa is plagued by a number of Salafist jihadist organizations, chief among them being; Boko Haram, Harakat Al-Shabaab al-Mujahideen (HSM), Al-Qaeda in the Islamic Maghreb (AQIM), Sinai Province, and the Islamic State affiliates in Libya. As Ramadhan beckons and chief jihadist ideologues call for a coordinated war against both secular and non-Muslim governments, it is quite probable that al-Shabaab would seek to coordinate its terror campaigns with its affiliate groups (al-Muhajiroun in East Africa and ADF-NALU in Central Africa) as well as AQAP (al-Qaeda in the Arabian Peninsula) in Yemen. Moreover, the Somalia-based jihadist group would also probably coordinate its offensive with far-flung jihadist organizations such as Boko Haram, AQIM and Sinai Province. With an approaching Iran-US entente, it is quite probable that Gulf Arab nations may covertly arm as well as provide critical intelligence support to al-Shabaab in order to stymie the increasing Iranian influence in the East African and Horn of Africa region. It is an undeniable fact that most Gulf Arab Monarchies have armed and used jihadist groups as leverages to maximize their regional influence. They are not likely to stop supporting these jihadists in the near future, especially when they feel threatened by Shiite sedition and subversion. If the jihadists coordinate their offensives in Africa, they would create a destabilizing crisis as inept Sub-Saharan African governments will suffer massive losses; while psychologically, they would prove to the Western world that their intelligence agencies had underestimated the strength, willpower and organizational sophistication of jihadist entities based in Africa. Redefining Regional Politics and Foreign Policies. Somalia is a nation in crisis as political bickering and clan factionalism erode the authority of the Somali national government. In such an unstable political environment, al-Shabaab intends to project overwhelming military prowess in order to appear militarily suave, adept and powerful, thereby enabling the terror group to exert inordinate influence over the political process in Somalia as well as stealthily redefine the nation’s foreign policy with the implicit intention of degrading the military potency of AMISOM (African Union Mission in Somalia) – by creating a foreign policy crisis that would put the government of Somalia at loggerheads with the governments of the troop-contributing countries. In Kenya, al-Shabaab intends to use its attacks and violent engagements with the nation’s security forces to redefine the relationship between the government and its Muslim subjects as well as pressurize Kenya into withdrawing its forces from Somalia in order to protect the home front. Apart from altering the political structure in Kenya, al-Shabaab also aims to re-orient the economic configuration of the nation by inflicting extensive economic damage to the fragile tourism industry as well as denying ordinary Kenyans the ability to enjoy the benefits of the economically-important Lamu port and the Standard Gauge Railway (SGR – which is also likely to suffer sabotage from terror activities). Thus, in the coming days, al-Shabaab plans to conduct a brutal general offensive on the Muslim month of Ramadhan in order to alter the course of jihad in East Africa through a series of coordinated terrorist campaigns which would serve to upset the counter-terrorism strategies in place as well as create an accompanying crisis in confidence, thus enabling it to redefine the course of regional politics - and in extension, the future of Africa. The worst outcome for the region would result from a fragmentation of regional counter-terrorism strategies as special interest groups show indifference to the approaching jihadist peril while the affected governments misunderstand the scope and magnitude of the threat facing their respective nations. Comments must strictly be on-topic, moderate, civil, and above all, show decorum. Obscene, malicious, insulting, threatening, or vituperative comments are not allowed. Non-civil comments characterized by Hostile tones, Hectoring, Undue Sarcasm, Over-reliance on insinuations, and unacceptable condescension will be deleted. Likewise, comments aimed at provoking violence will also be deleted.